Market Alert - Stocks or Bonds? 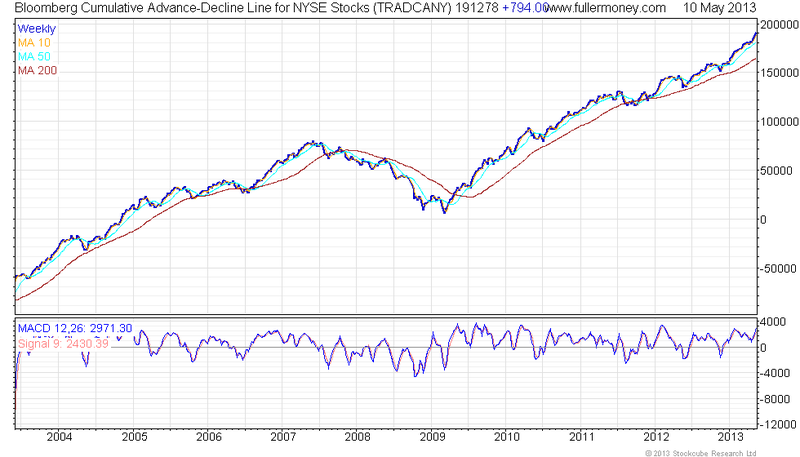 The persistent uptrend in equity markets in 2013 has been a sight to behold. Equities are now accelerating higher and due at least a short-term pause. Accelerations are typically ending patterns in stock markets. The S&P 500 closed today (Tuesday 21st May) at 1,669, a full 26% above its long-term 200-week moving average. Equities are heavily overbought in the near-term and quite overvalued relative to bonds, as the following chart shows. Be patient about adding to your stock portfolio at the present time. Equities are now quite overvalued relative to bonds. The S&P 500 is trading 26% above its long-term moving average and pricing in an awful lot of good news here. Mark Hulbert of the Hulbert Financial Digest tracks stock market recommendations of multiple newsletter writers. Hulbert recently reported that newsletter writers are now recommending a net long position in stocks of 71%, the highest level since January 2002 and the 10th highest level ever since 1997. The advance/decline line (ADL) is recognised by many investors as an accurate measure of the health of the stock market. The ADL simply measures the number of rising and falling stocks on the NYSE. When the ADL is rising, the majority of stocks on the exchange are in an uptrend; when the ADL is falling, the opposite is true. Usually, the ADL forms a peak ahead of the stock market. As fewer and fewer stocks participate in the rally, the trend in the ADL reverses and starts heading lower, usually weeks or months before the stock market tops out and prices reverse lower. Today, the ADL is making new all time highs suggesting that the strong momentum move higher will continue in the months ahead.